When you first import your Common Cartridge the end dates for assignments that you've set in alta will also come over into Canvas. If you need to change the end dates after the course starts, you can change them in alta and either you can reimport the section cartridge or manually alter the dates in Canvas. You can change dates at the parent course outline level to trigger date changes to all child sections in alta. Section instructors will then have to reimport the section cartridge or manually alter the dates in Canvas. Note: parent course level date changes will not apply to items you have previously changed at the child section level. Question: Will due dates update automatically in Canvas if you change them in alta? Question: Will due dates update automatically in alta if you change them in Canvas? 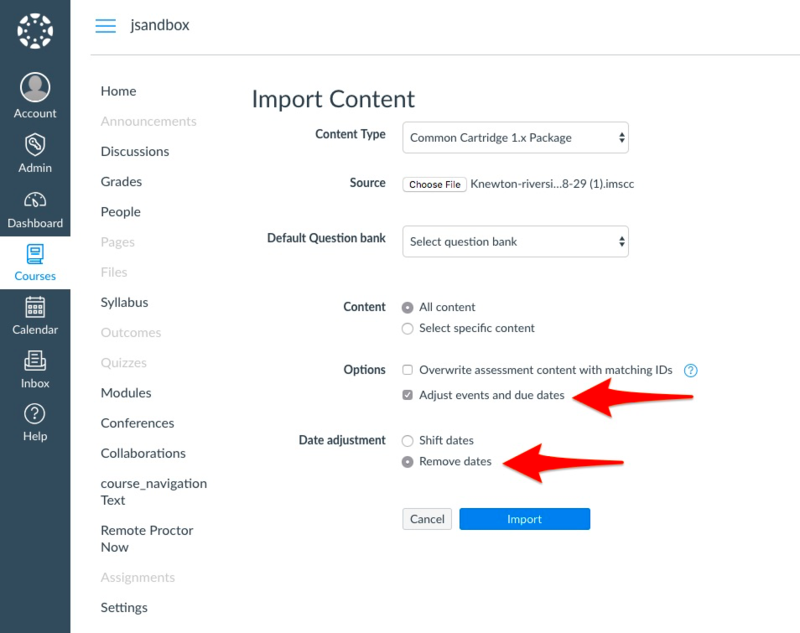 If you would prefer to leave out your assignment due dates when importing your common cartridge, choose 'Adjust events and due dates' under 'Options' and 'Remove Dates' under 'Date Adjustments'.